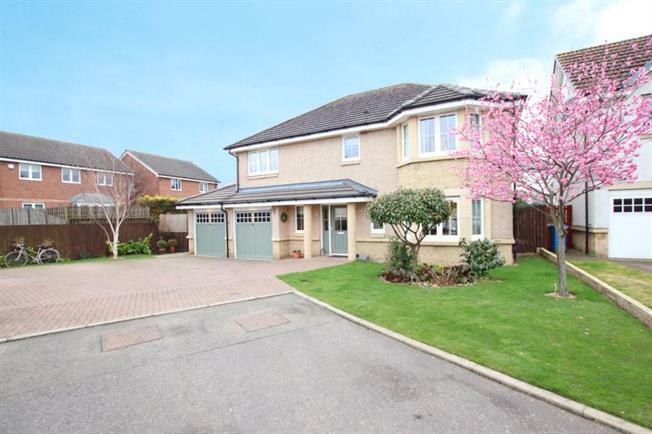 5 Bedroom Detached House For Sale in Kirkcaldy for Offers Over £308,000. Slater Hogg & Howison are proud to present this breath-taking extended five bedroom detached executive villa located within a highly desirable development. The current owners have completed the property to a great standard with modern fixtures and fittings installed throughout. Internally the property comprises of a bright and airy entrance hallway with under stairs storage cupboard, spacious open lounge/ dining room with feature bay window, fully fitted kitchen with a range of base and wall mounted units, complementary work surfaces and integrated appliances, positioned nicely within the kitchen is a breakfast area with multi fuel fire. Accessed through the kitchen is a fitted utility area with door to the rear garden, modern wet room and the double garage can be accessed via an internal door. A stair case from the entrance hallway provides access to the upper level which consists of master bedroom with two integrated wardrobes and accompanying en-suite, second bedroom again with integrated wardrobe spaces and en-suite, bedroom three and four are both good sized doubles with integrated wardrobes and have access to the adjoining Jack & Jill. Fitted bathroom with a separate bath and shower cubicle and a fifth good sized bedroom. Warmth is provided by a gas fired central heating system and double glazing is installed throughout. A mono block driveway permits off street parking for multiple vehicles and access to the integrated double garage. Surrounding the property are private and well maintained garden grounds with a laid lawn, flower bed and cherry blossom tree to the front and to the rear is a laid lawn, flower beds and shed/ greenhouse. Kirkcaldy town has a wide range of services and amenities including theatre, library, museum, local shopping, banking and recreational facilities. Kirkcaldy town has a local rail and bus station which connects to most areas including Edinburgh.